I've been noticing issues in Sheepshaver since upgrading to Yosemite. I was using Photoshop to apply some filters when I discovered that sometimes the system forgets that I'm pressing the command button, and instead triggers a photoshop tool key. For example, when trying to repeat a filter with command f, instead it recognizes f only, so it switches document display modes in photoshop. I can hold the command button down and repeat the filter several times, and it will randomly refuse to register that the command button is even being held down at some point. It's really cramping my speedy workflow as now I am unintentionally switching to different tools when trying to copy and paste and repeat filters. I have tested the issue with different keyboards to try and isolate the problem and all the keyboards exhibit the same problem. Maybe Yosemite is changing the way inputs work on the emulator, or more likely it's something about Yosemite that breaks Sheepshaver. After further testing I found that it effected all programs to varying degrees. It was less likely to happen in SimpleText or the Finder as opposed to Photoshop 3.0 or Illustrator, so something funky is going on in the emulator it appears. Could it be related to the fact that it runs in 32 bit mode? This was confirmed by several users. Also a single report so far. It would be helpful if other users would report whether they do or do not experience these issues in Yosemite. 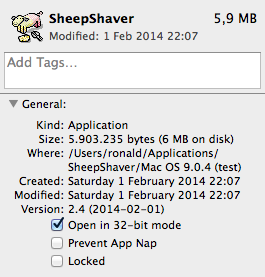 SheepShaver code has not been updated for use with current OSX versions. It still can only be compiled on OSX 10.6 (Snow Leopard). It is a miracle that it runs reasonably well in Yosemite at all. Drastic rework of the code needs to be done if we do not want to loose SheepShaver with future OSX versions. But who is interested to devote his time, skills, and energy, to a major project like this? Perhaps there is a solution for the 64 bit problem. Daniel Sumorok put a fix for 64 Basilisk for Yosemite in his github repository. It could be this also fixes SheepShaver. I have no build environment available for SheepShaver, but perhaps Ronald could give it a try? I will try as soon as I have the time. I still have Snow Leopard running on a MacBook that I kept for this very purpose. Is this a file that is linked to with "make links"? I'm not having any problems with slirp for Internet, so I'm not sure what's causing the other user's issue. I last ran Sheepshaver on Mountain Lion and it worked great. I might set up a Mavericks system to check for differences. Unchecked 32 Bit mode. Command button issue still persists in 64 bit mode, so no change. Yosemite handles the GUI differently IIRC, so they probably broke something in the way keys work. That's only a guess though. Update: Another discovery - The left command button has issues, but the right command button does not! Hmm??? That rules out Yosemite per se as the cause of that issue. I'll post a note in that topic. You unchecked the "Open in 32-bit" box in SheepShaver's Finder Info panel and run SheepShaver in 64-bit mode? The general consensus seems to be that SheepShaver will not run in 64-bit mode in Yosemite. Are you sure you run this copy of SheepShaver for wich you disabled 32-bit mode? Another discovery - The left command button has issues, but the right command button does not! Hmm??? The left and right modifier keys are not the same. They are usually interpreted identically but a software developer can choose to treat them differently. In the current macemu source there is no such code in BasiliskII/src/Unix/configure.ac nor in SheepShaver/src/Unix/configure.ac. No code to apply this fix to. Yes, I was just checking. Indeed, this code seems specific to dsumorok builds. (I have tried both WITH and WITHOUT keycodes, same issue with command button). I do not know if the command-button issue and 32-bit vs 64-bit mode could be related. I am having a similar problem with Sierra. The Command key is frequently not working in that when I combine the Command key with another key, the result is as if I just entered that other key without the Command key down. It seems to happen randomly, about 25% of the time. I have had this problem for quite a while but thought it was a problem with my keyboard, even though I did not encounter the problem outside Sheepshaver. But I have a new laptop and the problem continues so the problem cannot be the the particular computer. I am using the build from 1 Feb 2014. In case it is relevant, the problem seems to happen exclusively when I am programming in Think Pascal, though I think this is probably only because I primarily use Sheepshaver for running Think Pascal and I don’t generally use the Command key when running other applications under Sheepshaver.